Varco Pruden Buildings (VP) is a world leader in providing innovative pre-engineered steel building systems. Each year, VP supplies materials for approximately 6,000 buildings—ranging from 1,200 square feet to more than one million square feet. 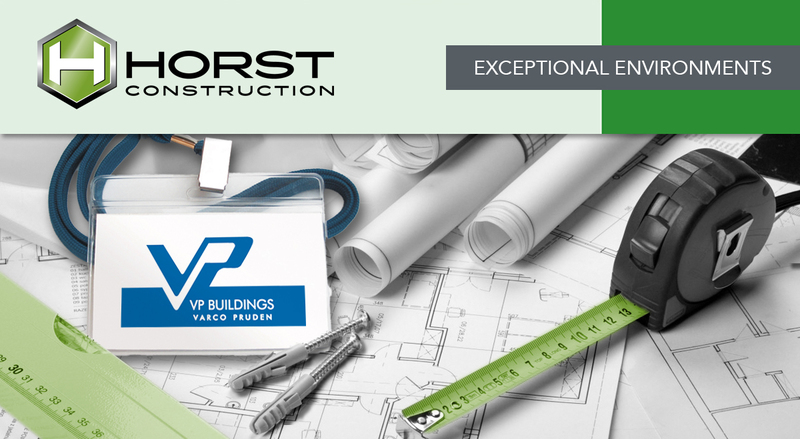 Today, VP welcomes Horst into its network of nearly 1,000 independent Authorized VP Builders across the United States and Canada, as well as throughout Central and South America, Europe, and Asia. Horst’s coverage includes Central PA, State College, and parts of New Jersey, Delaware, and Maryland. VP specializes in the computer-aided design of pre-engineered steel systems for low-rise, nonresidential buildings. The company works closely with its network of partners to offer extraordinary aesthetic appeal with optimum functionality. While pre-engineered steel may have had a negative connotation in the past, VP materials and designs are very appealing and modern, while offering great value. Take a look. All VP’s steel products are fabricated in the U.S.
VP is an active participant in both the Cool Roof Rating Council and the U.S. Green Building Council (USGBC), which maintains the LEED (Leadership in Energy and Environmental Design) rating system. Varco Pruden Buildings is a division of BlueScope Buildings North America, Inc. Headquartered in Memphis, Tennessee, Varco Pruden sells and engineers steel building systems for low-rise commercial applications, including manufacturing, warehouses, schools and commercial projects. The company utilizes seven manufacturing locations across North America. Varco Pruden has affiliations in Europe, Asia and South America and is a member of the Canadian Sheet Steel Building Institute, the US Green Building Council and a founding member of the Metal Building Manufacturers Association. For more information, go to www.vp.com.